Okay, so remember how I kind of complained about not being totally sold on the identity of the mystery villain after last issue? Yeah, well, this month Mark Waid forces me to eat every single one of those words. At one point, I even heard his voice in my head going: “See? I’m way ahead of you! Now, eat those words. Eat them!” Okay, so that last half of that statement may have been added after the fact (I do not have an evil version of Mark Waid living in my head), but you get what I mean. So, I’m just going to put it out there: I will never doubt this creative team ever again! Because, whatever I or anyone else might find to nitpick about, they’ve clearly already considered it. Specifically, my biggest “nitpick” going into this issue were my strong feelings about Bullseye not being a natural mastermind. However, when Waid has Daredevil, during his encounter with Bullseye, voice those exact same thoughts, that really does make a huge difference: “This isn’t your style. You’re a hitman, not a master-mind.” Of course, having our protagonist provoke the question doesn’t absolve the writer from having to provide an answer – which he does – but it makes every reader out there thinking the same thing feel a little more validated in their initial doubts. Bullseye’s journey from agile gun-for-hire to tin-man genius did signify a big departure from the villain we were used to. This issue acknowledges that. So, what answer does Waid and the rest of the team provide us with? Well, a very compelling one. A flashback scene shows us Bullseye’s resurrection and subsequent transformation, brought about by Lady Bullseye’s deep – and oddly moving – devotion to the man who “made” her. Chris Samnee’s art here is super-strong, and I’m particularly impressed with the way Bullseye’s obsession with Daredevil, as seen below, is depicted. Any fan who has ever read the classic Frank Miller issue “Devils” (Daredevil #169), will know what I mean. Brilliant! Since this review has to count as an early one, I really want to keep it as free of spoilers as possible. This makes it kind of hard to go into the details of the last two thirds of the issue, except to say it is full of twist and turns, along with things that are just twisted. The initial stalemate seen in the first few pages predictably erupts into a fight scene that is as riveting as it is economical. Unlike the fight scene from Daredevil #25, which took up most of the issue, this scene has just a few pages at its disposal. Despite this, it is large in scope, and doesn’t feel rushed at all. By the end of the issue, the larger story has been resolved to my absolute satisfaction, and the way it happens is very much in line with what we’d expect from a comic book and main character as complex as Daredevil. Matt is more human than angel, and Waid is an expert at handling that important distinction, without ever sacrificing the integrity of the character. Here he leaves both characters and readers alike with much to contemplate after all is said and done. This issue also shows Matt at his smartest (if you’ve read the issue, you’ll know what I mean). While I’m running out of ways to describe just how much I love the artwork, I’ll give it another try. It is at once chilling, charming, dynamic, expressive, and clear, wherever either one of those are called for. If I were to throw in some Marvel-sanctioned adjectives as well, I might add amazing, indestructible and superior. In fact, I’ve become so used to easily and intuitively understanding everything going on in every panel within a fraction of a second that I need to read comics other than Daredevil before I realize just how unusual that is. Few artists make the reading process quite so immediately accessible. It’s almost like having a story uploaded directly into your brain. Chris Samnee seemingly never loses track of the fact that he is telling a story first and foremost, and nothing is added to or left out of a panel that gets in the way of that objective. Colorist Javier Rodríguez’s contributions to the finished look of the book cannot be overstated, and his colors are truly the perfect complement to Samnee’s line art. They not only help set the perfect mood, they also add to the clarity by directing the reader’s eyes to all the right places. In Bullseye’s hideout, the different shades of blue used in the background help keep us perfectly oriented relative to the light coming in from the outside, and on the level below, a slightly different set of hues gives it another, very distinct feel. I almost feel bad for the main character who is unable to appreciate this vibrant world he lives in. The end product (topped with the perfect cherry that is Joe Caramagna’s lettering) is one fantastic-looking piece of entertainment. Actually, entertainment isn’t even the right word. It’s more like a monthly visit to a world that may not look “real,” but feels one hundred percent true. I loved this issue, and I hope you guys did too. Luckily, next month’s issue – with Javier Rodríguez pulling double duty – is out in two short weeks. Oh, and thanks to regular commenter Dan for plugging this site in the letters section! You know Dan, I still think the Deathstalker theory was great, and we have nothing to be ashamed of! This may have been just me, or maybe it’s obvious and I just messed some piece of exposition, but the scene showing Hand building that coffin-suit for Bullseye kind of reminded me of Klaw building the sound-suit around Daredevil in issues 2 and 3. I don’t know, the mechanisms looked very similar. Another amazing issue by Waid and crew. I have to still say I would have still preferred another villain, but Waid knocked it out of the park with the ending. It still irks me a little that basically any villain just needs time and patience to be a “mastermind”, but it was well done. Final scene with Foggy was perfect. The “Miller” moment was great and put a big smile on my face. At this point if Marvel has any class whatsoever, they should retire Bullseye. He is completely beaten and should no longer be a threat, and it was a 1000x better written and more creative ending for him than the garbage Bendis came up with. Lady Bullseye and Ikari both can now fill the roll that Bullseye had in both Daredevil and the Marvel U. Of course this is Marvel and their business is spoon feeding man-children the same stories over and over so next year Bullseye will probably be back as a magical cyborg who is EVEN MORE DEADLY AND DANGEROUS THAN EVER BEFORE! And I say Marvel, because I think Mr Waid is, hopefully, done with Bullseye, but some other Marvel book will have him show back up. If Marvel has some class left, they should make Mr. Waid write the next 100 issues and then cancel the series somehow pretty. Good issue, though it sort of wrapped up a little too neatly for me to be completely comfortable. Haha. I’m confused about Bullseye being deaf. I mean, he probably figured out how to read lips but characters weren’t always in his line of sight. And Ikari was fully masked. Did I miss something? Well, it appears that his present abilities, limited as they are, are provided by the big can he’s in. In Daredevil #26, he’s shown hooked up to some kind of (presumably advanced) hearing aids. In this issue, he says: “I am deaf but for this apparatus.” So he can hear while he’s in the metal can apparently, though to what extent is hard to tell. So manny thoughts about this great issue of Daredevil! I thought Ikari was a somebody, not a whole new character. My guess was White Tiger, so I hope that makes everyone feel better about the Death Stalker theory. I’m on the fence about the teliscoping billy cub. The thing came from left field last issue and this one. On the last page it pops out like 7 times. That is one magic billy club. Could this be Stilt-man technology? Derp. So I did miss something. 😛 Thanks. I freakin’ loved this ish and the storyline. Dan w/o Fear, if it makes you feel any better, your Death Stalker theory was quite convincing to me. The only glitch I thought had credibility to your theory was that Waid wasn’t going to use a character that few of the new readers would know about. I was hoping it wasn’t Bullseye and now that I have an image of Bullseye coming back as a magical cyborg as Robert mentioned, I am all that more wishing it had been the Death Stalker. The cyborg comment gave me a good laugh. I stopped laughing when I realized it is likely going to happen. Continuity wise, I was done with Bullseye back in the Murdock Paper days when DD trounced him and was never a fan of him being in the Dark Avengers, Shadowland, etc. I was also pleased that DD stopped being a wimp and started thinking ahead as he did by positioning his allies next to all of those close to him. Pathetic DD hopefully is gone for awhile. I’ve just read the SarahBowden blog on this issue and realized that two things completely passed me by. DD Didn’t really kill Bullseye, which removed the stain on his character, that always felt wrong to me. ( I’ll ignore the rest of Shadowland as DD possessed ) Then the issue replaces that stain with something just as bad by being ambiguous about whether DD lets Bullseye get blinded. Have I missed something or has DD gotten all Punisher on us whilst we were all enjoying the ride?? Oh and another cracking issue. Gordon; You never know, the return of Death-Stalker could still happen under Waid’s tenure on the book. Here’s hoping, because I still think that the character has potential. I’d even be interested to see Matt just come up against the second, female version of the villain. One point that I wasn’t too sure of in this issue was -SPOILERS(? )- the great reversal where we see that actually the people watching Matt’s civilian friends were of course his super-friends… Is there still a threat there? Are Bullseye’s agents still waiting in the wings? Or were they already taken down by Matt’s own agents? Maybe this point will be addressed in the next issue. With regards to Matt letting Bullseye get blinded. I have to wonder what the point of that was. Because yes, while Bullseye no longer has his sight, what’s to say that the toxin wouldn’t restore some of his other senses in compensation…? Waid has established sensory depravation and radiation and can lead to … something. Hello all! Long time reader first time writer. I really loved this issue! As always great pacing, and amazing artwork and coloring work. I love how Waid combines heavy issues and themes while still balancing it with action and humor. It just shows how good a writer he is, and how well he understands the characters that he is writing. He is really showing all the different roles that Matt can fill as an “actor”, I bet your in Heaven Christine. Although I was a little disappointed that Bullseye was the big villain, he was just to obvious a choice, but Waid really made it work and addressed all the big problems satisfactorily. Although one thing that has been bugging me, how does Ikari have sight and a radar sense? What does he see double or something? But anyway he is still a cool new villain. Cant wait to see the next issues. Any thoughts on how DD is going to react to the Silver Surfer? Now that is a crazy match up! 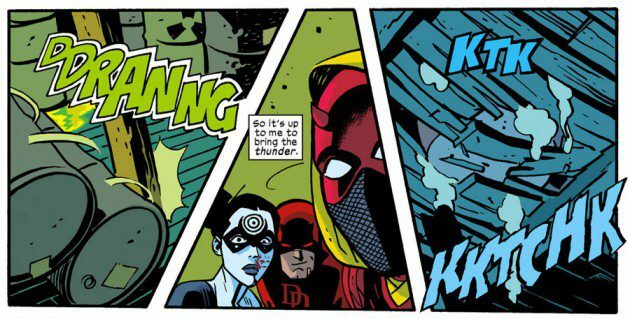 Also just wanted to point out in case anybody missed it that DD had a small guest appearance in Deadpool #11. One page in this comic displays just how superb a writer Waid really is. The page where we the readers learn exactly who is surrounding Matt’s loved ones and associates. Wonderful pacing, great action, tense drama, unanswered questions, certain situations left unresolved, an epic ending to this epic story. Terrifc job all around.